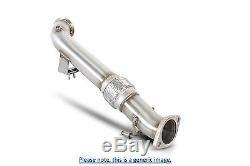 Scorpion Performance Exhaust Vauxhall Astra Mk 4 5 2.0 02-09 Down Pipe. Scorpion Exhausts > Car" target="_top" id="similar>View Similar Items. If there is any doubt on the application for your vehicle please provide your registration so we can check fitment. Please note this is an aftermarket product. Must supply UK Number Plate to confirm fitment. Please Note: All images used are as accurate as possible, and should be used as a guide. In some instances, a sports-cat image may be used on a listing offering a de-cat. There may also be cases of centre sections showing a silencer on a system that doesn't include a silencer and vise-versa. These are images that are provided directly by Scorpion themselves. Any images used are intended to give an idea as to what the system looks like, and shows relevant bends, connections, finishes etc. Discover The Benefits Of A Scorpion Exhaust. To ensure correct fitment of a product, please provide your vehicle registration (Number Plate) on checkout - see screen shot below. We cannot take any responsibility if a part does not fit if no vehicle registration was provided on checkout. You shall receive a SVXC041. Your order may be made to order. This manufacturing time to accounted for within the dispatch time indicated above. All items are sent on a 24hr courier service (UK Mainland only) once completed for dispatch. We have to have a stock level indication above in order to have an active listing. Having the right connections, and working with only the best companies in the world, we are able to supply our own range of OE Quality Replacement products. Scorpion have been quietly winning motorsport championships for over 20 years, consistently beating teams which are very publicly supported by rival exhaust manufacturers who construct entire marketing campaigns around their racing involvement. Scorpion's meticulous attention to detail and superior engineering skills put them at the very top in terms of construction quality and reliability. You really are getting more bang for your buck. So stop reading about it and get a Scorpion Exhaust fitted now! Please be aware that whilst we make every effort to ensure this listing is as accurate as possible, there may be other options that fit your vehicle. There may be other factors that can determine if a part will or will not fit your vehicle. These factors can include, but not limited to, Engine Number, Engine Code, Chassis Number, Production Date, Registration Date, Country of Origin, Transmission Type, Additional Features (ABS, TCS, Air-Con etc). Whilst the checker may say this fits the same vehicle as the one you have, it doesn't confirm 100% suitability for your vehicle. We do ask for the customer to check fitment prior to ordering. We also ask for the registration (UK Number Plate) of your vehicle to be provided on checkout (even if fitment has been checked beforehand). The sales advisors that checks fitment prior to ordering, may not be the same one who processes your order. If no registration is provided on checkout, we will dispatch the item you have ordered. IMPORTANT NOTE RE: STOCK LEVELS. Please see the bullet points below. The quantity of items available is correct at the time of uploading this listing. The item "Scorpion Performance Exhaust Vauxhall Astra Mk 4 5 2.0 02-09 Down Pipe" is in sale since Friday, June 19, 2015. This item is in the category "Vehicle Parts & Accessories\Car Tuning & Styling\Performance Exhaust\Other Performance Exhausts". The seller is "clickcarparts" and is located in GB. This item can be shipped to all countries in Europe.